Leaving Courthouse, Zimmerman Kills Four More Threatening People Under "Stand Your Ground"
SAN NARCISO, Calif.. (Bennington Vale Evening Transcript) -- After 16 hours of deliberation, a Florida jury acquitted George Zimmerman of second-degree murder on Saturday, allowing him to walk free from criminal charges in the shooting death of Trayvon Martin. Critics, civil rights leaders and legal experts were stunned at the decision. Under Florida state law, a heavily armed citizen may slaughter another person he encounters on the street, so long as the shooter believes his life to be in peril. Zimmerman invoked this "Stand Your Ground" defense after he slayed the unarmed teenager, and the state saw fit to exonerate him. But on Sunday afternoon, Zimmerman made headlines once again by killing four more people in Sanford who frightened him half to death. Two of the individuals were reporters from Ebony magazine trying to get a statement. No other journalists were harmed. Again, police did not have enough evidence to make an arrest. Zimmerman's defense attorney, Mark O'Mara, stated that they would rely on Stand Your Ground and double jeopardy if the state opted to pursue the matter legally. "We shouldn't even see court time," O'Mara said. "If George were black, this would be a non-issue: the police wouldn't be bothering with us in the first place." Following George Zimmerman's Feb. 26, 2012, killing of 17-year-old Trayvon Martin, who threatened him with a bag of Skittles, authorities let the armed neighborhood watch captain walk free, citing the state's "Stand Your Ground Law" of self-defense. Zimmerman strengthened his case by invoking what legal insiders have named the "Skittle's Defense." Zimmerman is just one of many victims who displayed the courage to leverage the protection of the sweeping Florida law, which posits that a belligerent and predatory offense is a heck of a defense. One Florida official explained that "Mr. Zimmerman was so frightened of what Trayvon Martin might do with his bag of Skittles, he hunted him down like a three-legged dog with arthritis and butchered him on the street corner. That's the power of fear. Fight or flight. Zimmerman did what any of us would've in the same situation." 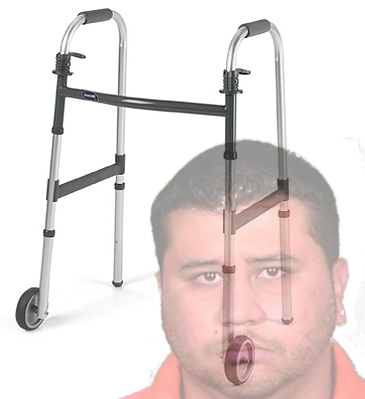 Among Zimmerman's latest assailants were a disabled senior citizen and a mime. Zimmerman came across the elderly woman around 11:00 a.m. Sunday. He described her as agitated, "out of her mind dangerous" and wielding some kind of four-bladed "oriental weapon." Witnesses refuted Zimmerman's account, alleging that the senior had been screaming at a cab that sped through the crosswalk in front of her. The weapon, they said, was her orthopedic walker, which she yanked from the path of car. Zimmerman, consumed with fear and armed with a concealed .9-millimeter firearm, dispatched the woman with five rounds.